But hold on a bit, because it’s not like a high rise is going up in Paris built entirely by flying robots. Too risky! Instead, a squad of the compact quadrocopters are going to embark on an impressive demonstration of architectural forward-thinking. In what is probably a first in robotics, the quadrocopters assembled by Italian designer Rafaello D’Andrea are going to execute a design made by a Swiss architectural firm. The six foot high cylinder will be composed of precisely measured rectangular blocks cleverly stacked on top of each other. 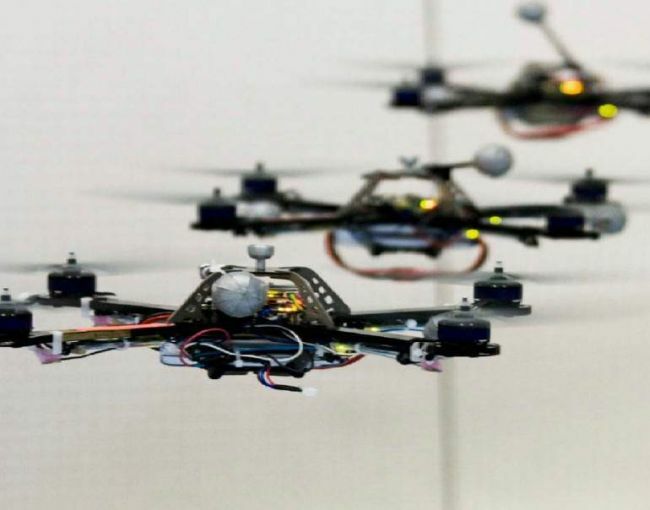 The quadrocopters will lift each piece individually and arrange them to form a twirling structure. The installation that emerges should at least hint that robots are the next frontier in heavy duty construction. It’s also a great promotional tool for the architects at Gramazio & Kohler, who want to exhibit their smarts for an almost three month duration, starting on December 2 when their abbreviated skyscraper goes live for public viewing in the FRAC Centre in Orleans, who are hosting the rare occasion.